As the Internet becomes increasingly heterogeneous, the issue of congestion control becomes ever more important. In order to maintain good network performance, mechanisms must be provided to prevent the network from being congested for any significant period of time. 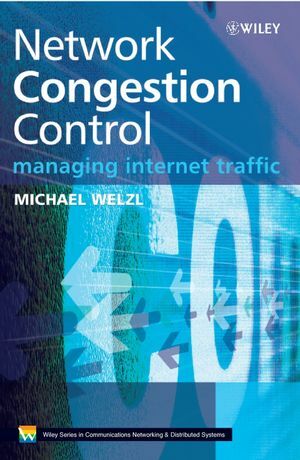 Michael Welzl describes the background and concepts of Internet congestion control, in an accessible and easily comprehensible format. Throughout the book, not just the how, but the why of complex technologies including the Transmission Control Protocol (TCP) and Active Queue Management are explained. The text also gives an overview of the state-of-the-art in congestion control research and an insight into the future. Presents comprehensive, easy-to-read documentation on the advanced topic of congestion control without heavy maths. Aims to give a thorough understanding of the evolution of Internet congestion control: how TCP works, why it works the way it does, and why some congestion control concepts failed for the Internet. Explains the Chiu/Jain vector diagrams and introduces a new method of using these diagrams for analysis, teaching & design. Elaborates on how the theory of congestion control impacts on the practicalities of service delivery. Includes an appendix with examples/problems to assist learning. Provides an accompanying website with Java tools for teaching congestion control, as well as examples, links to code and projects/bibliography. This invaluable text will provide academics and researchers in computer science, electrical engineering and communications networking, as well as students on advanced networking and Internet courses, with a thorough understanding of the current state and future evolution of Internet congestion control. Network administrators and Internet service and applications providers will also find Network Congestion Control a comprehensive, accessible self-teach tool. Dr. Michael Welzl is lecturer at the Leopold Franzens University, Innsbruck, Austria. He has been involved in Congestion Control for the last 5-6 years. 2.3 Controlling congestion: design considerations. 2.5 Source behaviour with binary feedback. 2.7 Rate-based versus window-based control. 2.14 Congestion control and OSI layers. 3.4 TCP congestion control and reliability. 3.5 Concluding remarks about TCP. 3.6 The Stream Control Transmission Protocol (SCTP). 3.7 Random Early Detection (RED). 3.8 The ATM‘Available Bit Rate’ service. 4.1 Ensuring appropriate TCP behaviour. 4.4 Enhancing active queue management. 4.5 Congestion control for multimedia applications. 4.7 Congestion control in special environments. 5. Internet traffic management – the ISP perspective. 5.1 The nature of Internet traffic. 5.3 Quality of Service (QoS). 5.4 Putting it all together. 6. The future of Internet congestion control. 6.1 Small deltas or big ideas? Appendix A: Teaching congestion control with tools. A.2.1 Using ns for teaching: the problem. A.2.2 Using ns for teaching: the solution. Appendix B: Related IETF work. Appendix C: List of abbreviations.